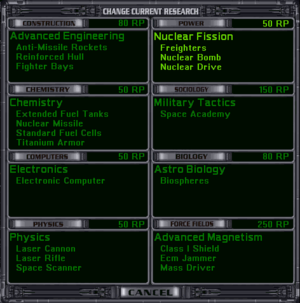 The Biology techs appear in the 3rd row of the right column in the Research Menu. None. You have to research all Biology techs in pre-Warp games. Fully-automated building that increases a colony's food production by 2 without needing any farmers. Its main advantage is that its output is not reduced by blockades, however it has a high maintenance cost compared to its output. Like most farming techs, Hydroponic Farm cannot be researched by Lithovores. Building that increases a colony's maximum population by 2. Best choice for non-Creatives: Biospheres. The 2 extra citizens can produce much more than 2 food, and will pay taxes, instead of having maintenance costs. The Biospheres also effectively increase population growth, because population growth depends on maximum possible population. Use Housing colonies to quickly fill the extra space created by the Biospheres. Building that increases a colony's population growth by 100k per turn (a single farmer/worker/scientist icon represents one million people). Construction project that does not produce a building but increases a colony's food output by 1 per farmer. Note, that Soil Enrichment cannot be built on Barren, Radiated, and Toxic planets. Like most farming techs, Soil Enrichment cannot be researched by Lithovores. Ship Special Weapon, a biological bomb, which can only be dropped on a colony from zero range, if the attacker does not have Transporters. Each Death Spore bomb has a 10% chance of killing a colonist. Your diplomatic relations will suffer severely if you use them, but that seldom matters as Repulsive is the most common negative pick in race design. Best choice for non-Creatives: Lithovores cannot have Soil Enrichment, so Cloning Center is the clear choice here. Other races should usually take Soil Enrichment, since that immediately frees up colonists from farming and provides a permanent bonus, while the Cloning Center's effect takes time and it offers no benefit when your population eventually maxes out. Empires that do not take Cloning Center should make sure they use Housing colonies. Cloning Centers, however, are viable option for Unification empires with extra population capacity (aqua, subterranean), because their increased food production can keep pace with rapid population growth until they research weather controllers. Death Spores are not be a serious threat to yourself or your enemies while ships are slow and no-one has Transporters. Achievement that gives a +5% bounus for both "Spies" (espionage and sabotage against other empires) and "Agents" (your counter-intelligence operatives). Achievement that increases population growth of all colonies by +25% and halves the effectiveness of Death Spores and Bio Terminators. Best choice for non-Creatives: depends on your race and on the other techs you have chosen or plan to choose. Races with a population growth bonus should generally choose Telepathic Training; and so should Democracies, which are weak in counter-intelligence. Races with a counter-intelligence bonus (Unification, Dictatorship) or those with a population capacity bonus (Subterranean, Tolerant, Aquatic) should generally choose Microbiotics. Construction project that improves the planet's type; Barren becomes Desert or Tundra, Desert become Arid, Tundra becomes Swamp, and Ocean, Arid, and Swamp becomes Terran. Terraforming a planet will increase the food production and planet's maximum population, although the exact benefits depend on your race design. Terraforming costs increase depending on how many times the planet has already been terraformed (possibly by another empire). For details see Growing your population and Feeding your people. Fully-automated building that increases a colony's food production by 4 without needing any farmers. Its main advantage is that its output is not reduced by blockades, however it has a high maintenance cost compared to its output. Like most farming techs, Subterranean Farms cannot be researched by Lithovores. A building that increases a colony's food output by 2 per farmer. This tech can be researched by Lithovores, probably just so they don't get a free pass to the next level of Biology. Best choice for non-Creatives: For colonies with less than 12 max population or worse than swamp - choose Subterranean Farms. Otherwise choose Weather Controller, as it has lower maintenance and increases food output by more. By this stage you should be able to destroy or chase away pesky little solo blockaders. Achievement that gives a +10% bounus for both "Spies" (espionage and sabotage against other empires) and "Agents" (your counter-intelligence operatives). Also increases morale by +10% for Feudal and Dictatorship governments and their advanced forms (the in-game tooltip lists only Dictatorship/Imperium, but Feudal/Confederation receive the bonus as well; it does not affect Democracy/Federation). Achievement that increases by 1 RP the research ability of all scientist of your race; does not apply to captured colonists of other races, nor to Android Scientists. Dictatorships should usually choose Psionics, as they get a +10% morale bonus which applies to all citizens of any race; this will usually increase total research by at least as much as Heightened Intelligence, and also improves farming, industrial and financial productivity. Democracies need all the help they can get in counter-intelligence, so should always choose Psionics, even if they have few citizens of other races. Unification and Galactic Unification governments should almost always choose Heightened Intelligence, as research is often their greatest weakness, they naturally have good counter-intelligence, and they get no morale benefits. Feudalisms and Confederations are the least clear case: they urgently need a research boost whenever they can get one, but which tech will do this more effectively? In principle Psionics remains the best choice for a multi-racial empire. But Feudalism is a negative race design pick because of its poor research, and Feudalisms often go for strong population bonuses to compensate (the pre-defined Sakkra race is a good example), so even after many conquests the majority of a Feudalism's citizens may be of its founding race; in this case Heightened Intelligence may boost research more than Psionics does, and the Feudalism / Confederation should choose Heightened Intelligence. Ship Special Weapon, a type of biological "bomb" that, like other bombs, can only be dropped on a colony from zero range if the attacker does not have Transporters. Each Bio Terminator "bomb" dropped has a 20% chance of killing a colonist. Your diplomatic relations will suffer severely if you use them, but that seldom matters as Repulsive is the commonest negative pick in race design. Achievement that increases population growth of all colonies by +50% and decreases the effectiveness of Death Spores and Bio Terminators by 75%. Not cumulative with Microbiotics. Best choice for non-Creatives: Universal Antidote. Achievement that increases food production on Toxic, Radiated and Barren planets from 0 (i.e. no farming) to 1 per farmer. The manual states that it increases food production on all planets, but that's not the case in-game, so the tech is fairly useless. By this point most of your planets have been terraformed and there should be surplus food as well as a sufficient fleet of freighters. Like most farming techs, Biomorphic Fungi cannot be researched by Lithovores. Construction project that upgrades a Terran-class planet into a Gaia-class planet, increasing the food production and size limit. The effects vary on the depending on the inhabitants' race, see Growing your population and Feeding your people for details. Achievement that allows you to use 4 extra race design picks however you like, except you cannot alter your current picks and you cannot choose additional penalties. Best choice for non-Creatives: competitive games do not usually last long enough to reach this, especially as there are higher research priorities (mostly military) including Hyper-advanced research in subjects with strong military benefits. For aquatic or tolerant races, only Evolutionary Mutation makes sense. Usually the best pick this late in the game will be Warlord, allowing to maintain a much bigger fleet with higher experience levels. This effect is more profound in Unification races, who at this point have a ridiculously high industrial output. Researching Hyper-Advanced Biology is useless, since Biology has only 1 military tech that would benefit from Hyper-Advanced miniaturization - the Bio Terminator, but the weapon itself is not particularly useful and only Creative races will even have it available.